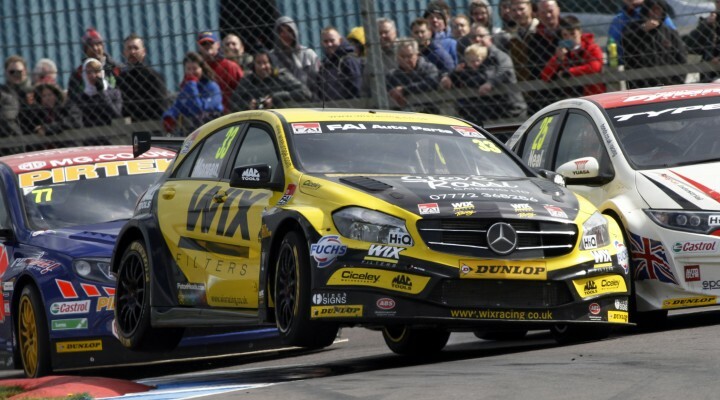 Adam Morgan secured his first podium of the BTCC season at Donington Park as his WIX Racing Mercedes A-Class showed yet more front-running pace. Having won at the final event of 2014 at Brands Hatch many were wondering if Morgan and his squad could mount a serious championship challenge this term. It’s fair to say that the jury is still out on that particular question but the signs are positive so far. Although left slightly disappointed by a 12th place qualifying berth in the season opener on the Brands Hatch Indy circuit earlier this month, Lancastrian Morgan showed all of his race craft to walk away with a trio of points paying results. He signaled his intent with a fourth place in race two, following in the wheel tracks of three touring car champions during the race. The VW duo of Colin Turkington and Jason Plato, and Honda of Gordon Shedden, proved to be the class of the field during qualifying at Donington Park last weekend (18/19 April), but who was the guy closest to the experienced champions? Morgan and WIX Racing claimed fourth on the grid, with undoubted championship challenger Andy Jordan trailing behind him in the MG. This year’s added tactical challenge of increased success ballast plus having to run the Dunlop Sport Maxx soft compound has left several teams coming up short, and although Morgan dropped to ninth in race one it would prove to be a pretty decent result. With minimal weight and the harder tyre compound onboard the Ciceley Racing-built Merc flew in the second encounter. In true BTCC style Adam was embroiled in several titanic tussles, swapping positions with regularity, but he was able to keep the car out of trouble to score a third place finish. He admitted that carrying a significant 57kg of ballast in race three hampered his efforts slightly as he could only bring home the car in 12th, but kept up his record of scoring points in every race. In fact only he and reigning champion Colin Turkington has achieved that feat after six contests and Adam is only one of only five drivers to have completed every racing lap. Scotsman Aiden Moffat was also able to show the pace in the Ciceley-built Mercedes’ by scoring his best result of fifth in the final race, pointing to yet more progress being made by the outfit. Ciceley’s Commercial and Marketing Manager, Norman Burgess, said: “Another very positive team performance this weekend both on and off the track. Adam is more than keeping his end of the bargain and we enjoyed a brilliant weekend with our VIP guests in the hospitality. The weekend’s points haul sees Adam lie joint seventh in the Drivers’ Championship and second in the Independents’ standings.